Curling Stones for Lego People: Leather Bracelets (with tutorial)... How do you wear yours? 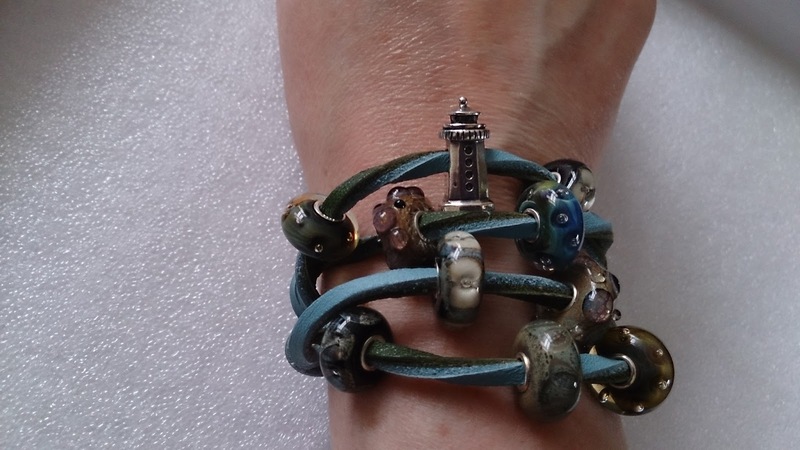 After blogging and tweeting my Rocky Beach Leather Bracelet I was asked, more than once, how I made it look "like that", which in turn led on to several conversations about Trollbeads leather bracelets, with some people confiding that they avoid wearing them as they've not found a look they're happy with. Today's post is all about different ways to wear a leather bracelet, or more accurately the different ways I wear my leather bracelets, and by request a step-by-step guide to creating my Rocky Beach Leather Bracelet. 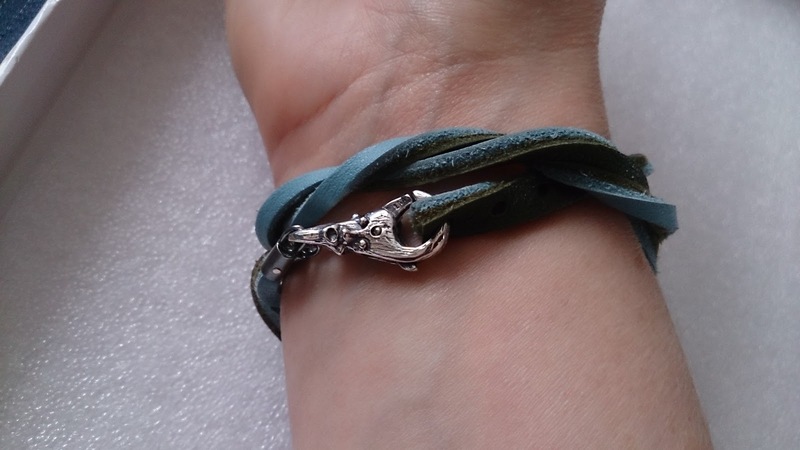 When I first got my blue leather bracelet it was a snug fit; it's best to buy as snug as you can as leather will naturally stretch over time and you can always fasten it on a longer setting initially as you have multiple holes to adjust the length you wear it at. Bracelets come in 3 different sizes so it is important to try one on to see what size suits you best, I wear the smallest one. 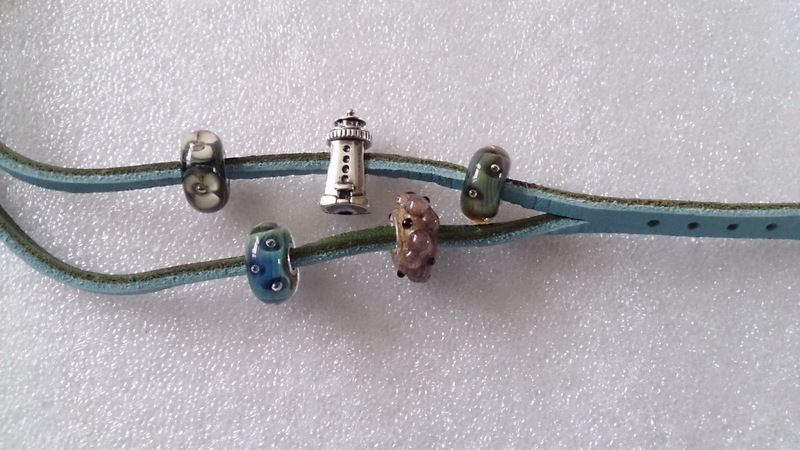 My first combinations were a few beads strung on the bracelet. At first I could only get 3-4 beads on, but as the leather started to stretch I could fit more on. I didn't do much else with it at this stage. 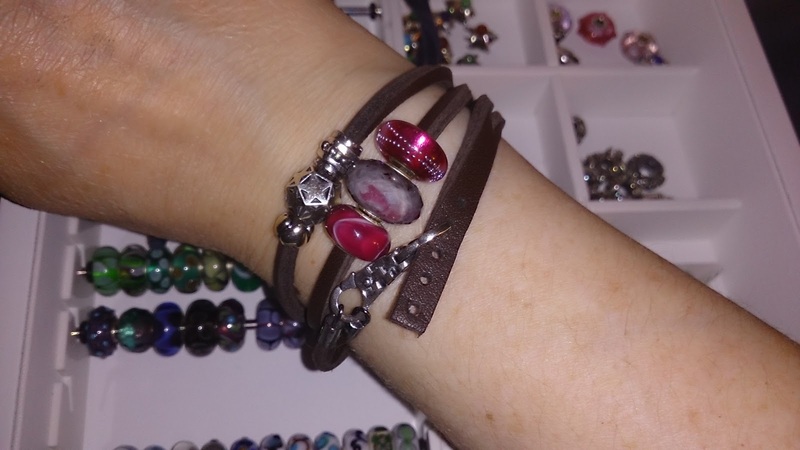 Trollbead leather bracelets are 1 long piece of leather that is split into 2 strands, these wrap around your wrist twice so you get 4 strands to play with a look. The 2 strands have metal loops at the end that you attach to the small end of a Trollbeads lock, with the wider end attaching to the leather thick strand that has holes in. Later I started to experiment with making the combinations more "messy", the before picture on the left below is just after I put the bracelet on, the after picture on the right is the bracelet "arranged" with a silver combination doubled up in a stack. You can see there is a massive difference in how it looks from putting it on to "arranging it when on" to get the best effect. Unlike making silver bracelets up - where all the arranging happens before you put the silver bracelet on finished - with leather it can be the opposite, a little twist or arranging can make all the difference; the important thing is to play and try out different styles to see what suits you best and what you like. Another before and after picture on how I wore this one, sometimes less is more, here I twisted the 2 long strands together to give it more "texture" which also helps to keep the "2x3 bead combination" in place. The following 2 photos are what I call "messy combinations". 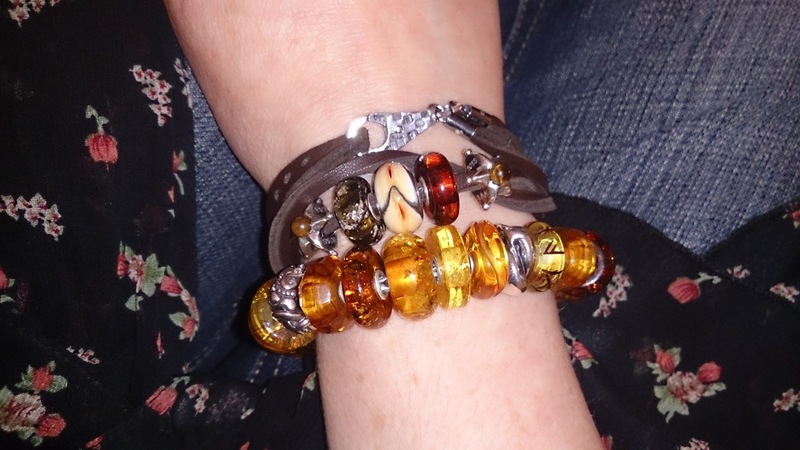 The first is a mix'n'match of totally uncoordinated beads for a fun bracelet worn on an afternoon out, I was wearing dark jeans and a black top so the only pop of colour was on my wrist. The second photo was another messy combination but with fewer colours. 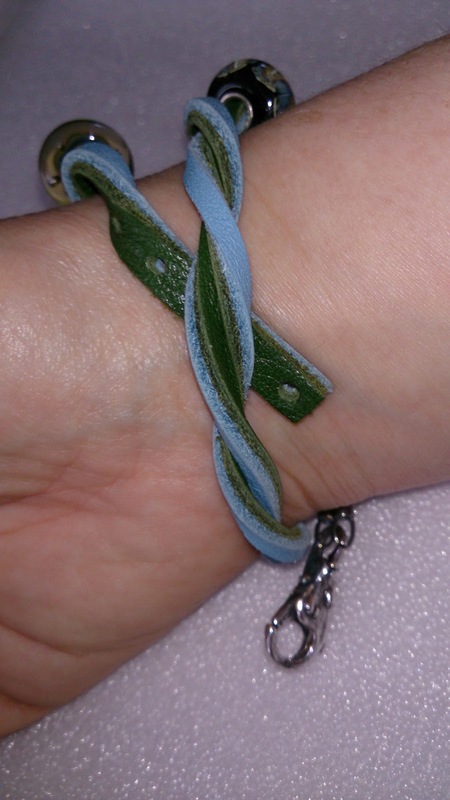 I love my first blue leather and I still get a lot of wear out of it, but 6 months later along came a brown leather bracelet and I reverted to a favourite 2x3 design for it's first outing. 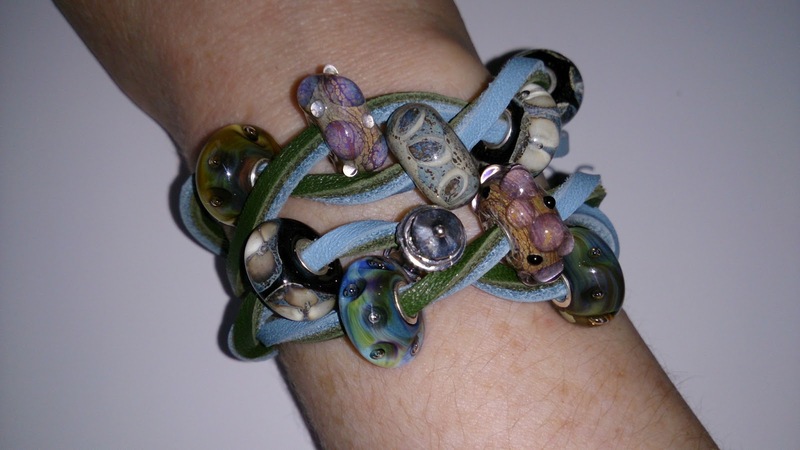 I love the messy combinations I made in the photo below using my dragon beads, and the blue bracelet was an experiment with spring colours that only survived long enough for me to take this photo, it wasn't actually a combination I ever wore. Below is my focal bead bracelet using two stoppers to keep this combination in place, I love this bracelet and it's a great way to wear a really big bead that didn't work for me on a silver bracelet. One of my favourite brown leather combos was this one, made with my Ruby Rock bead and Chess lock worn at the front - a style I copied from my friend Mike who writes a blog over at Mike's Trollbead Adventure! This creates a 3 strand look and lets you show off an ornate or special lock as well as your beads. The two final combinations shown below are more recent, the first made with my Easter Swap Beads sent by my swap partner, and the second is how I'm currently wearing my brown leather showing off my new "craggy" amber. So those are a variety of ways I've been wearing my 2 leather bracelets. The combination I've had most questions about though has been my 2-tone Rocky Beach Bracelet shown below. 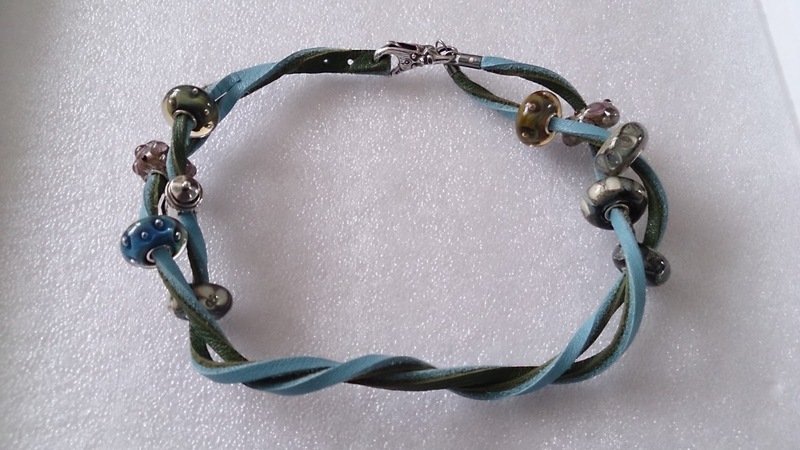 Start by threading your beads on the leather bracelet. On the left strand I put 3 beads on first, then 2 beads. On the right strand I put on 2 beads and then 3 beads so you have 5 on each wrap around your wrist, 10 in total. Close up of how this looks when you space them out in a line. I did think about the order they went in, but not too much as I knew I was going to make a messy twisted combination... 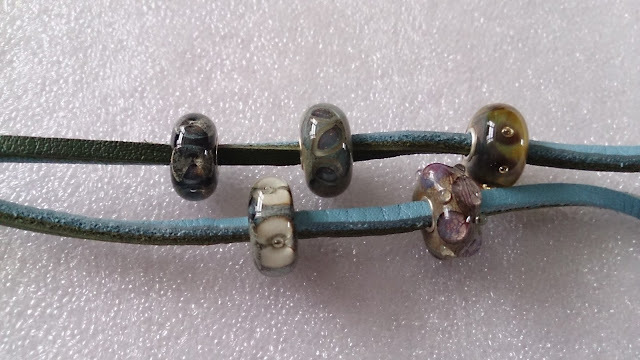 I spaced out the bubble beads, put Silver Lighthouse in the middle of a 3 bead combo and put Pebbles and Fossils on different stages (they are actually on the same strand which isn't important), just that one is one the 2nd wrap and one is on the 1st wrap around your wrist. Then I attached the small end of the lock to the 2 metal ends, and I twisted the bracelet by holding the flatter larger end still and just twisting it around by the lock. The photo below shows it locked so I could take the photo! Now the tricky part, how to put it on "twisted"... or at least this is how I do it, the easiest way is to get someone else to do this but if you are on your own this is how I put it on (swearing optional). 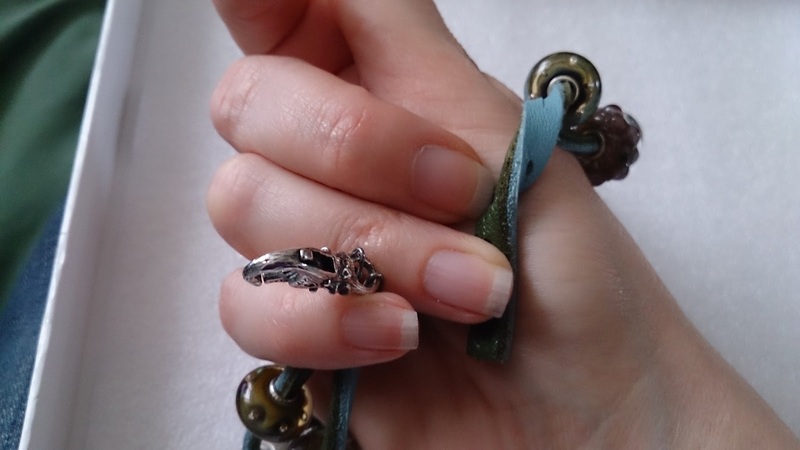 I hold the end with the holes under my middle finger, as I bring the lock around, I then cross the lock with my other hand over the end and use it to hold that in place whilst I wrap the bracelet around a second time. This then allows me to lock the the bracelet as the end is being held by the bracelet and I can concentrate on the lock. Bear in mind that I was not only doing up the bracelet, but my other hand was taking the photos, so I've got no photos of me actually locking this bracelet as I only have 2 hands!! The back of the bracelet locked, Trolltree lock does work on leather but if you're doing up twisted bracelets yourself it's probably not the easiest lock to use. My handy tip for getting it off is that it's MUCH easier to undo the smaller end attached to the 2 metal loops than it is to undo the large end from the leather holes. Below is a picture of the front of the bracelet before it has been arranged further, you can see that the effect you get is twisted strands along each of the 4 strands and that they are slightly twisted around each other as well as being individually twisted. 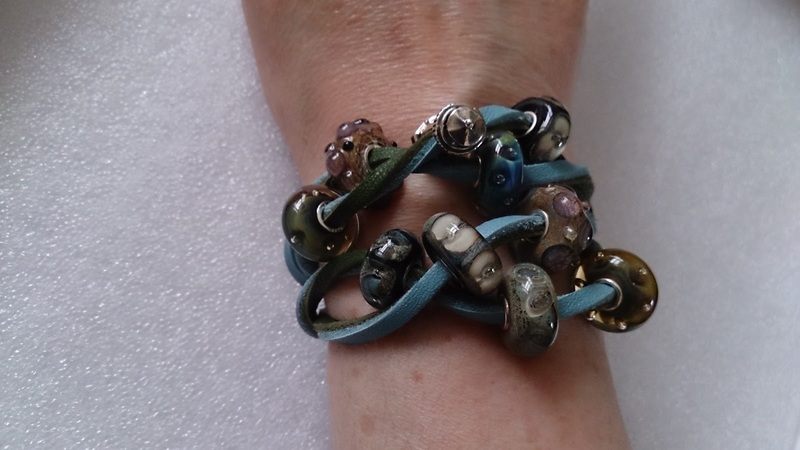 Once on I "arrange" the bracelet to suit, I do this by ensuring the front is very twisted so the 2 wraps are made up of twists around the beads, almost in a 1 over 1 under fashion - I don't twist the 2 wraps over each other. And here is the finished bracelet, it stays like this all day, because the twists help to keep it in place, and I also wear it as a snug fit. It ends up slightly different every time I do this but this is one of the things I love about twisted designs! Would love to hear about how you wear yours if you have one, or if you've considered getting one? Brilliant easy to follow steps, just what I need to get me started....thank you. Thanks Alison, can't wait to see what you do with your leather bracelet. This is amazing! Lots and lots and lots of inspiration. Really intrested in the way you arange yours, as I never do it quite that way. And the way you do it up is genius!!! Aw thanks Mike. 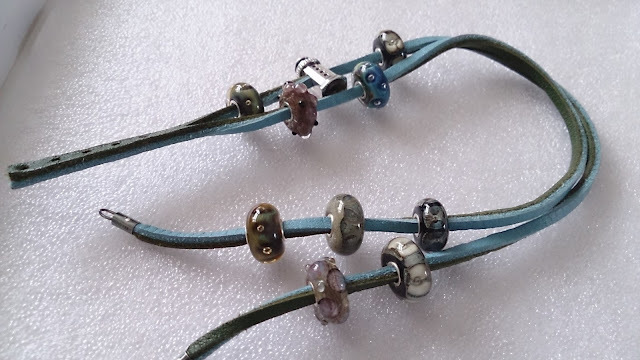 I think it's interesting how we all do these things - it never occurred to me to blog a "how to" until I got so many questions on the Rocky Beach Bracelet. 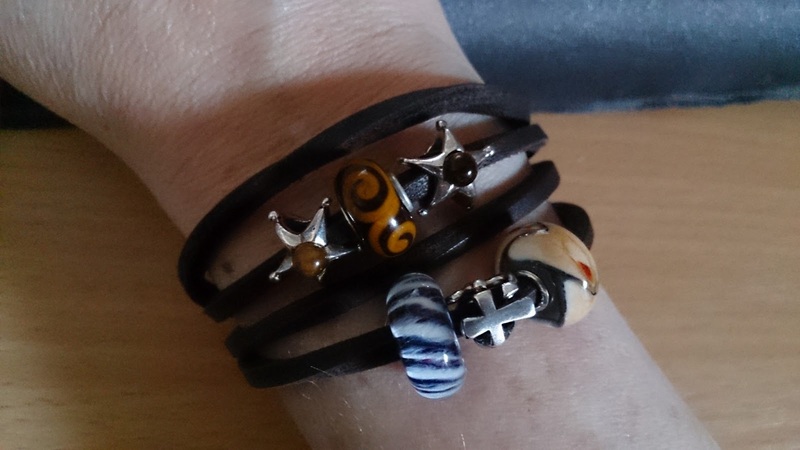 It's nice that I know someone else who makes so much good use of the leather bracelets, I think they often get overlooked and there are so many different ways they can be worn, love seeing how others wear them! Glad you found this useful and found the blog, I think the leathers do allow a lot of creativity as they are so versatile but I do understand the problem that they can be a lot more fiddly, especially for arthritic fingers. As you can see from the blog post I didn't do much with mine at first, I got more adventurous through trial and error, some things work really well, sometimes things don't but each time I find something else I like doing with them it makes all the effort worthwhile! The 2-tone leathers work wonderfully with twisted designs as it really shows them off! I know a couple of people have put little rings on the end of the leather, through the hole they use most to help with the doing up issue, I don't personally because I use them differently so I don't always use the same hole every time, plus I like to "see" just the leather next to the lock as I like the way it looks, but that's just me personally. Others have said they find the larger locks, Big Fish or Big Flower, or basic lock easier to use. I quite like using plain lock or my chess lock with the leather as I find these are a bit easier to use. Stoppers are great when you need a combination to sit "tight" they are fiddly to get on, but once they're on they're on. Mike has said he has some small indentation in the leather where his are but I've not noticed this on mine. If you click on a month name, you will get all the blog posts for that month and if there are more than will fit on the page you can click on the older posts link. You can also translate the blog into your own language if English is not your first language. You can sign up for emails, so if a new post is published you will receive an email the following morning with the content. You can also search the blog for certain keywords and if it has the word in the article, or caption on a photo, it will give you a list of all those posts. Under the archive list you have a "cloud" of keywords, if you click on these it will bring up all posts that have been tagged with that word. Having said that that works only as well as I have remembered to properly tag the posts. You can use the social media buttons under the posts if you want to share to facebook, twitter, google+, blog or indeed email the post to someone else and of course you can always comment, as it's great to hear about what people think about a bead/post/life in general! I've tried to keep the layout fairly simple but every now and again it gets a bit cluttered and I have a clear out. So grab a cup of tea, or a glass of wine and enjoy!